Day 4: HOT Tomato Pie! 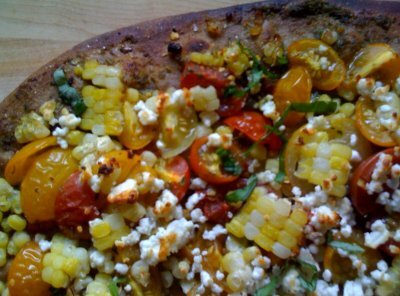 Place chopped tomatoes and corn on top of pizza crust. Bake 15 minutes or until crisp. So…. I have to admit… I f’d it up. You were supposed to bake the pizza with just the corn and cheese and then add the tomatoes after. I wanted the tomatoes hot though… so I did it all at the same time. BIG mistake. 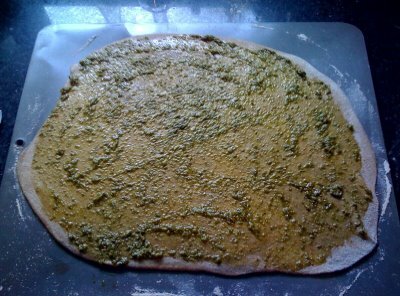 The center of the pizza dough isn’t cooked enough and the edges got very overdone. The good news is that I’m not eating it now… I made it for later. So when I heat it up, I will probably put it directly on the toaster oven rack to crisp up the bottom of the crust. It looks delicious though!